If I can get my hands on the exact playlist from this trip, I’ll post it here. Back in 2016, the “real” part of the trip started a bit west of Knoxville; most of us hadn’t been west of here before, so seeing new trees and a different time zone was awe-inspiring. We drove through Nashville, partly because it was 5 AM, but we also wanted to be more to the west for lunch. A few hours later, we drove aimlessly around Memphis. An intelligent DOT official made the decision to remove every highway sign, so we trusted our satellite-guided instincts and found the correct road. After even more hours, we found ourselves in Arkansas. It’s a nice state, if you Google things about it. Hot Springs, flat land, floods, and this hotel/zoo/safari place could make a fun trip; however, we were too damn hungry to think about anything. That’s when the Hurley House Cafe in Hazen appeared in front of the car. Keeping true to the suburban, white, middle-class, “woke” stereotype that society pushed on me, I thought this hole-in-the-wall would be underwhelming. It would turn out that Hazen produced the best BLT I’ve had – to date. (I’m always accepting challengers.) After this very country lunch, we got back on the highway and made our way to Oklahoma City. People should keep in mind that driving from Charlotte to Oklahoma City in less than one day isn’t advisable. It’s actually tortuous, especially if you have to drive. Just ask my uncle. After eighteen hours, we made it to the Round Barn, then to Pop’s Soda Ranch in Arcadia. Their kale salad with chicken is great! We let this dinner sit on us at the Holiday Inn in El Reno, which is a bit west of Oklahoma City. Day one came to a close. I might be the only person who has ever slept on a coffee table. It was uncomfortable, but it was doable. The day’s first stop was at the Cherokee Trading Post, south of Indianapolis, Oklahoma on Route 66. On the inside, a menagerie of slightly offensive, yet fun gifts could be found around the store. I picked up a few postcards, which all wound up in a collage that is nailed to a wall at home. Down the road, we stopped at the National Route 66 Museum, the Devil’s Rope Museum, and the Volkswagen Slug Bug Ranch. 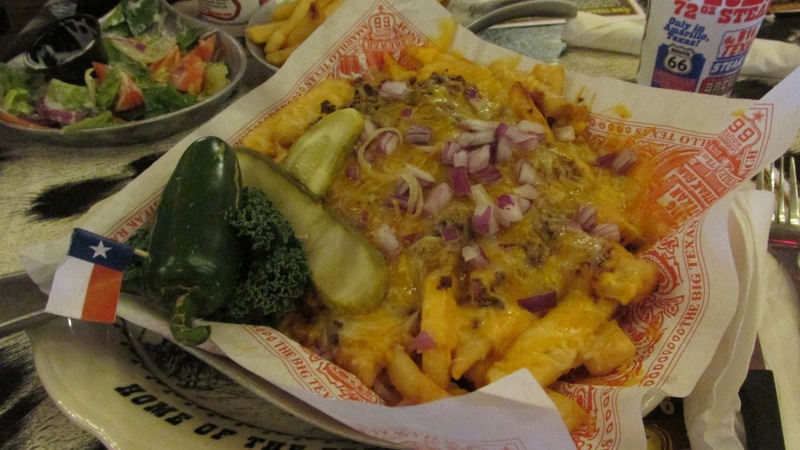 When we arrived in Amarillo, we were starving – and as the tourists we were, we stopped at the Big Texan Steak Ranch. The food was unsurprisingly amazing. I ordered steak fries, which were topped with chopped barbecue, cheese, barbecue sauce, and onions. To the side, a large jalapeño was provided as a garnish. If I recall correctly, we dared my uncle to eat the pepper. And he did. This was entertaining, but a man came to our table and starting singing area- and period-specific music. Johnny Cash’s “Ring of Fire” earned the man a $20 tip, which was a lot. No one can lie and deny this man’s entertainment skills; though, if he kept singing, we set the bar too high to tip anymore. Tip $10 per song, I guess. Get two songs in before you feel poor! The meal sat heavily on us all, but we didn’t embark on this trip to eat healthily; we went on this trip to gain a few pounds! On the other side of Amarillo, the Cadillac Ranch sits adjacent to Route 66, which runs concurrently with Interstate 40. 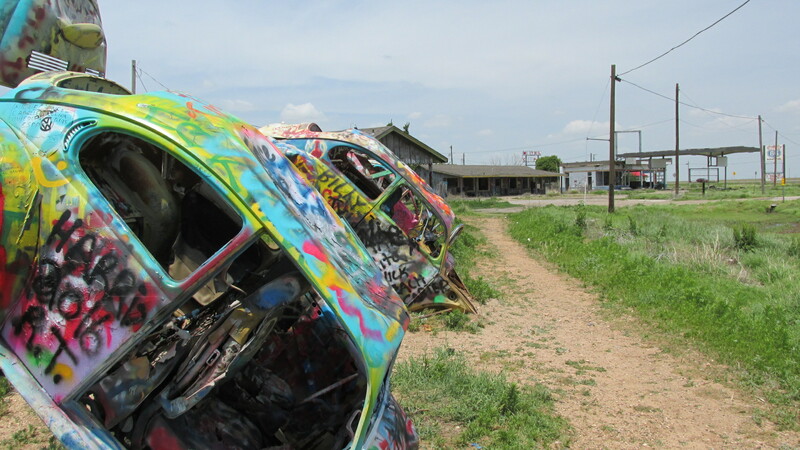 We took spray paint and painted these half-buried cars, which turned out to be very fun. I recommend that you bring your own neon paint, as the fun level decreases somewhat when you run out of canned color water. Late afternoon struck relatively quickly, with the sun illuminating the horizon as we entered New Mexico. A dirt road got our attention and we trekked through it. To my amazement, its bumpiness, along with its bisection of incredible farmland, was one of the most peaceful drives I’ve had the opportunity to be a part of. Our return to Route 66 was quick; soon after, we were on the way to Moriarty, NM, home to the Viceland-famous stripper truck stop, which we sought lodging near. 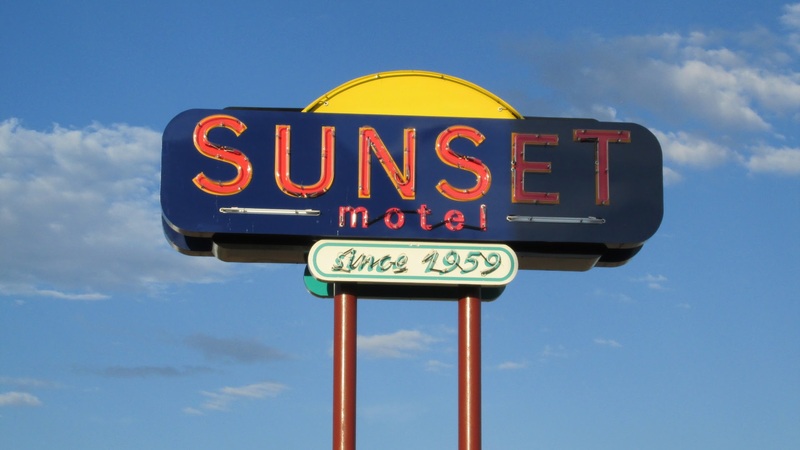 In an act of unintentional defiance, we spent the night at the Sunset Motel, which is advertised as a minimalistic, basic, family-owned motel. It lived up to all three of those tenets, but they failed to mention their amazing mattresses and pillows. The Land of Enchantment woke us up with a gorgeous sunrise. Almost indiscernible rays of light quickly coalesced into a deep blue, awesome sky that stuck with us for most of the day. While the morning began with a chill, the coldest temperatures of this trip were yet to be felt. 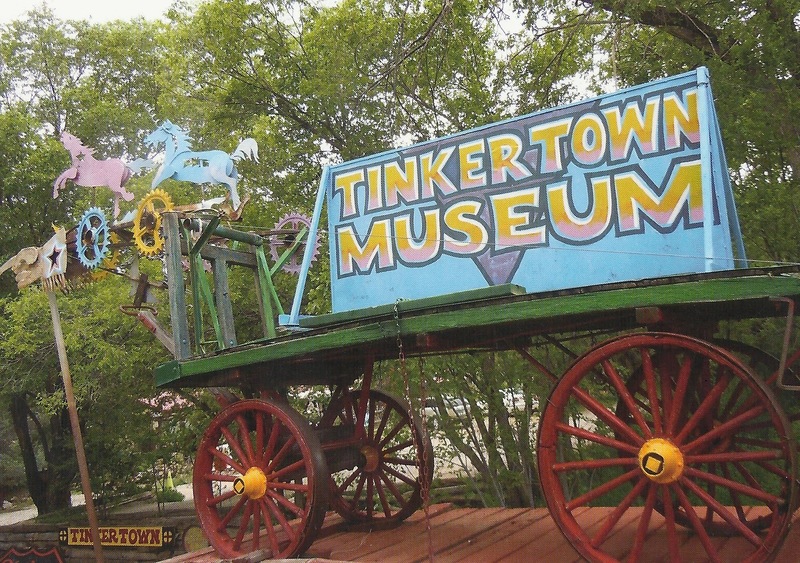 Near the Cibola National Forest, which is nestled between Albuquerque and Sandia Park, lies Tinkertown, a kitschy roadside museum.